A few weeks ago I shared how I made a canvas journal cover, today I am sharing a couple pages inside that journal. Hi, I am still working in the Linnie Blooms canvas Mini Mixed Stitched Book and posting my pages over at the LB blog and here as well. For these two pages I used a lot of paints and spritzing to make the bright and colourful background on the untreated canvas pages. That way I could maintain the texture of the raw canvas. I used two stencils, one(DecoArt) to create the background and the other (LB)to make the feathers which I collaged onto the surface. The complete list of the supplies I used are below and I am including links just in case you are interested in knowing how you too can get those same products. 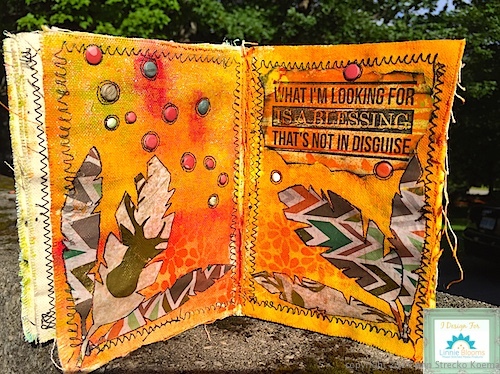 I hope that you are inspired to look at raw canvas as a possible surface to do some art journaling as well. Thanks a lot for stopping by and please if you have any comments or questions don't be shy and include them in the comment section below. Keep on Crafting! **THANKyou to Linnie Blooms, DecoArt, and The Robin's Nest for the wonderful products used in today's post.